Exergen today announced the integration of their customized IRt/c sensor into two of M&R's quartz flash units: the Red Chili D 1418 and the freestanding Cayenne D, M&R's most sophisticated and versatile quartz flash cure system. The units required higher intensity radiant lamps and/or more densely packed lamps. This caused not only a restricted view of the T-shirt area from the sensor location above the lamps, but also overheated the body temperature of the sensor itself. With the customized IRt/c sensor, the Red Chili D 1418 and the Cayenne D now deliver significantly faster curing speed without compromising quality. "We're always looking for ways to increase flash curing speed and quality in the most cost efficient way possible. That meant working with an innovative and industry-leading sensor vendor to find the sensor that met our requirements. That vendor was Exergen Global and the solution was the customized IRt/c sensor," said Boguslaw Magda, M&R's vice president of engineering and manufacturing technology. "Complex problems sometimes require simple solutions. The combined teams of Rich Hoffmann, CEO of M&R, and our team were able to tackle the problems in such a way that we not only solved it pretty quickly but also very neatly. The result is a completely customized sensor that works like a charm. The sensors have been delivered to M&R and the rollout of the Red Chili D and Cayenne Flash Cure Units has started," said Dr. Frank Pompei, CEO of Exergen Corporation. Product information: The Exergen IRt/c sensor lines are the most reliable, highest-performing IR sensors in the world. Key features include self-powered, intrinsically safe, repeatability 0.02°F (0.01°C), resolution approx. 0.0003°C and very important an interchangeability of +/- 1%. One of the main reasons for the unique performance of the IR sensor is the custom designed and built thermopile based sensor. 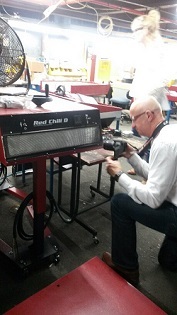 The Exergen and M&R mechanical teams found the right solution for both the Cayenne D and the Red Chili D 1418 flash cure units, and the new IRt/c Standard 4 Wire model, including an embedded contact thermocouple, is now in use. About The M&R Companies: M&R is the most respected name in the screen printing industry and the world's largest manufacturer of screen printing equipment. M&R has production facilities in Glen Ellyn & Niles, Illinois, USA, and in Wojnicz, Poland-and distributors and skilled technicians in over 40 countries on six continents. All equipment from the M&R Companies is built with M&R's unsurpassed attention to detail and commitment to quality, durability, innovation, and design excellence, and is backed by M&R's unparalleled 24-hour access to service, support, and premium parts.